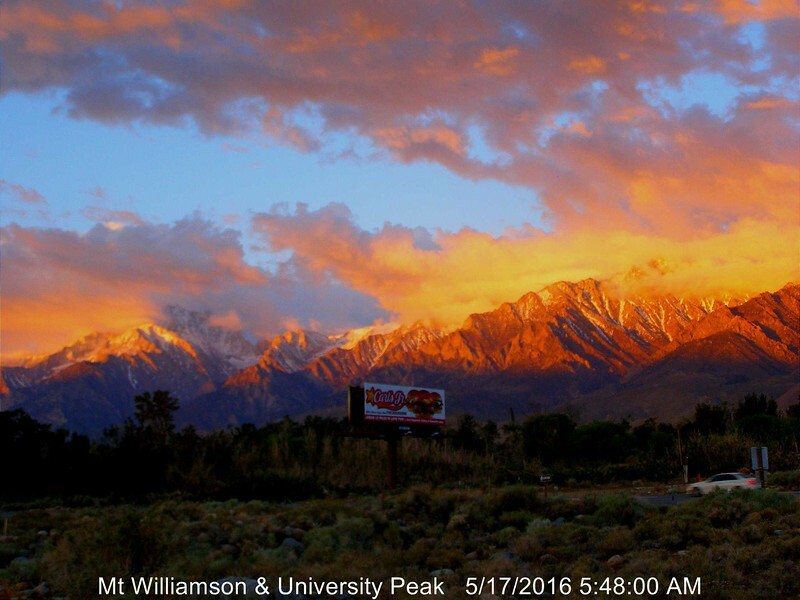 Our Mt Williamson web cam came on-line yesterday. It still needs to be pointed a little more south, but I am happy to see it up and running. This morning (6/24/10), Mt. Williamson is the peak on the left side of the picture. Can you please post a pic of the cam itself? Glad to know the issues with the I-net have been resolved at dmatt's office! It's amazing to think how many people were involved in this camera's setup. Pam, Gary, Dave, Dennis, Steve, Charlee, Rob. And a few others along the way. Here's a great big THANK YOU to each and every one!! Looks like the 395 is busy today. The camera keeps catching cars in the picture as they go by. WONDERFUL, Steve! Such a beautiful view! Thanks to everyone for their work on this! 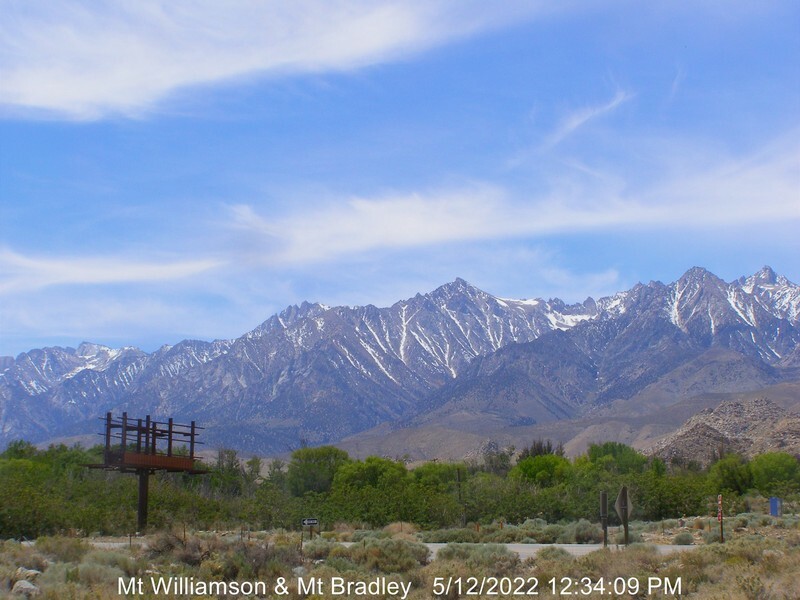 Any plans to put the Williamson webcam picture right below the Whitney webcam picture on the left sidebar? As of 12:13: Look at that lenticular cloud! Webcam is back up - good work, Steve! Note that it is also featured on the left under the Whitney cam. It appears the Williamson webcam finally quit today. It worked successfully for six years. About 300,000 pictures taken!! The Road Trip occurred last weekend, and we installed a "new" Olympus SP500-UZ, with a new box and power supply. Let's hope it lasts as long as the old camera. Here's a great picture from this morning, taken by the new setup. Saw that, came here to post it. 1) Looks like an oil painting. 2) I wonder if CJs would chip in a little for the exposure? And for more bad news... We just replaced the camera a few weeks ago, and now the old workstation unit running the webcam has crashed. Reports it can't find Windows. Does anybody have access to an old Windows computer that we might put into service? ...For example, an old desktop unit that still works but you no longer need? Sounds funky, like a file system error for windows. Depending on how old the box is a new HD and a clean windows install may sort it. Regardless, I've got a spare box I can donate to the cause. I will put a clean install of 32 bit windows 7 and as much ram as I can scrape up. I think I have a spare TB hd sitting around too. One of the benefits of being the IT guy at work. I'll be heading up to Coyote Flat to putz around on the 11th and could drop off on my way up if you cant find something sooner. Outstanding, Jake!!! The old system was a donated Windows XP box. We installed it in 2010, and it was old then! The power supply died and was replaced a year or two back. It is too old to try to resurrect. It was giving me funky Windows errors and the webcam software crashed several times in the past several weeks, too. It all points to the disk drive wearing out. If you can donate your Win7 unit, I am sure it will work great. It doesn't need anything like a big disk. 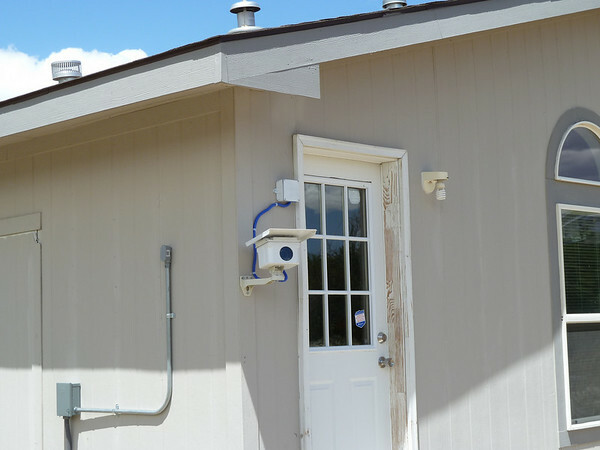 It just runs the one webcam software application, which runs a FTP process to transfer the pictures to the web. 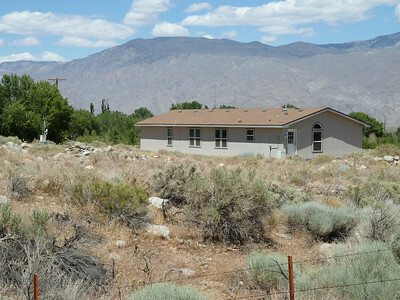 Probably the most important thing is for it to be set up to reboot automatically after a power failure -- that happens a few times a year in the Owens Valley. Are you sure that the webcam software runs W7 without needing Administrator level? Well, I see it does prompt me on my local unit. But can't we change the W7 security settings so that it allows it to start without the prompt? For a box such as this where no one is going to be going in and installing other stuff we can probably get away with disabling UAC in windows 7 and have the webcam software run just fine. The folder that the application keeps it own data in will probably need to be "blessed" by setting full access, and you may need to fix registry settings for that folder, or both. Steve...my wife tells me she has 60...yes, 60, computers ready for donation...Ah, Lone Pine 2012...Lone Pine 2016? Will send you a PM later or I may post here. Generated in 0.236 seconds in which 0.220 seconds were spent on a total of 15 queries. Zlib compression disabled.